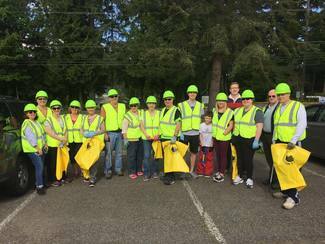 The job: Help us remove trash and debris from 228th Avenue between NE 30th and 8th Streets. Dress for weather. Meet outside MOD Pizza, near Safeway, on the North end of Sammamish Plateau at 9:15 am. Important: Must be 14 to participate. Permission slips needed for participants under 18. All volunteers sign volunteer waiver. Event Captain will go over safety rules prior to start. Event Captains: Pick up "road kit" after Tuesday, May 14th from Sammamish City Hall located at 801 228th Avenue SE, Sammamish, 98075. Return kit after event. Location: 228th Ave between NE 30th and NE 8th Street.